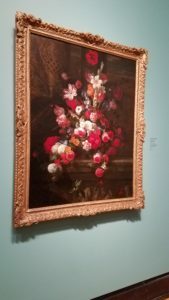 Art in Toronto – arts, ink. Last week was spring break. For some people, this meant heading south to enjoy warmer weather. For me and several of my friends, spring break provided a chance to go north across the Canadian border, where we spent a few days in Toronto, Ontario. There, it’s no surprise we faced blustery winds and cool temperatures. While my Instagram feed was filled with girls at the beach in their bikinis, my winter boots were covered in salt residue and melted snow; however, I wouldn’t have had it any other way. There were plenty of amazing things to do in Toronto. Besides eating our fair share of Asian food in Chinatown, we visited the CN Tower, Ripley’s Aquarium of Canada, and Allan Gardens. Places such as the Royal Ontario Museum (ROM) and Casa Loma presented opportunities to learn about art, history, and culture. At the Royal Ontario Museum, there were textiles, sculptures, paintings, and other artifacts from various different cultures and time periods. Some of my favorite sections of the museum included the Rome and Egypt exhibits, which included impressive busts and other artifacts. Additionally, one of the most unique and grand exhibits was the Daphne Cockwell Gallery dedicated to First Peoples art & culture. With over one thousand works of art and cultural heritage—including contemporary art—the gallery provided a sense of what life as an Indigenous person was and is like, including as a person of ancestry living in the contemporary world. 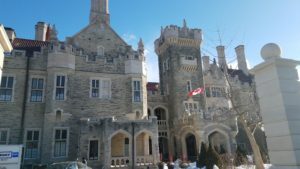 Visiting Casa Loma was another beautiful and interesting experience. Casa Loma is a grand mansion that was built in the early 1900s by an electricity multimillionaire. Famed for its extravagance, Casa Loma had (and still has) elaborately decorated rooms with authentic period furnishings. It was too cold to visit the gardens when we visited, but we were able to go up into its two towers. Besides the magnificent architecture, we admired the ornate sculptures, stained glass, and indoor fountain. We also appreciated seeing Toronto’s Graffiti Alley to discover a different kind of art. What seemed to be a little stretch of grimy back-alley was home to a mesmerizing series of murals. 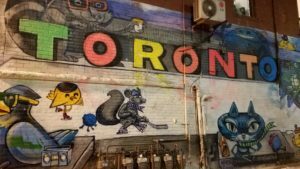 In addition to being a narrow stretch of art, the alley represented moments in Toronto’s history concerning street art versus vandalism, and was worth the cold open-air visit. Last but not least was the Art Gallery of Ontario (AGO). On Wednesday nights, AGO offers free admission to their collection galleries. We took advantage of this and explored the extensive gallery for a few hours. There was a vast number of paintings, whether from the Middle Ages or Impressionist movement. Besides paintings, there were drawings, photographs, and sculptures. Moreover, full volumes, videos, and mixed medium art were on display. The basement had a collection of model ships, while the fifth floor had a temporary exhibition called Mickalene Thomas: Femmes Noires. This collection explored how Black women are represented in art and popular culture by using colorful, dazzling, and provocative paintings, photographs, and screenprints. Another collection I found interesting was that of the gothic boxwood miniature carvings, which were small, intricately detailed religious wood sculptures. Overall, the trip was a memorable one, and I enjoyed exploring all the art and culture Toronto had to offer.